During our recent vacation to Bonita Springs, Florida, we rented a boat from Bonita Boat Rentals on a couple of different days. 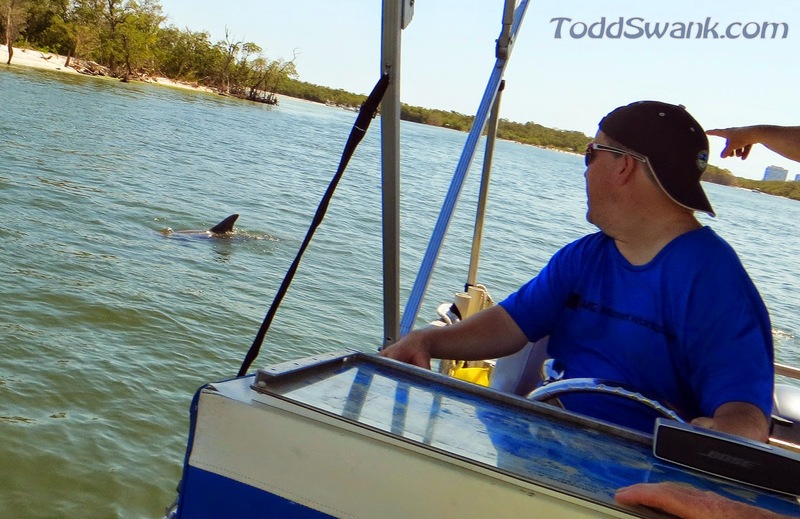 We wanted to explore the beaches on Estero Bay and hopefully see some dolphins along the way. We weren't disappointed! On the first day, Dave said he was fine with my driving the boat all day which made me feel pretty special. On the second day, we let the kids drive for most of the day. Which made me realize that my value add to the excursion wasn't all the valuable after all. The kids were all excited about the prospect of seeing dolphins out on the bay, but we were all secretly wondering if we'd really see any or if we wouldn't have any luck. There was no need for worry. We saw dolphins every where we went! We saw dolphins near the beach. We saw dolphins near dolphin sight-seeing boats. We even saw dolphins from the back porch of the house we rented. We saw dolphins that looked like sharks. And we saw dolphins traveling with friends. We saw dolphins every place. We just couldn't get a picture of a dolphin face! Every time we'd see a dolphin and get the camera ready to shoot, it's head would go under water. I think they do this on purpose because they are camera shy. This guy was so close, we could have probably reached in the water to lift up his head for the picture. But he probably wouldn't have appreciated that. 12 hours on a boat and all we could get was dolphin pictures in pre-Peek-a-boo states. With no Peek-a-boo payoffs! I gave the dolphins a hard time for not letting us take pictures of their faces, but the manatees were even worse! They were so elusive we only saw them a couple of times during the whole week we were there and never when we had a camera ready. Dang Manatees!